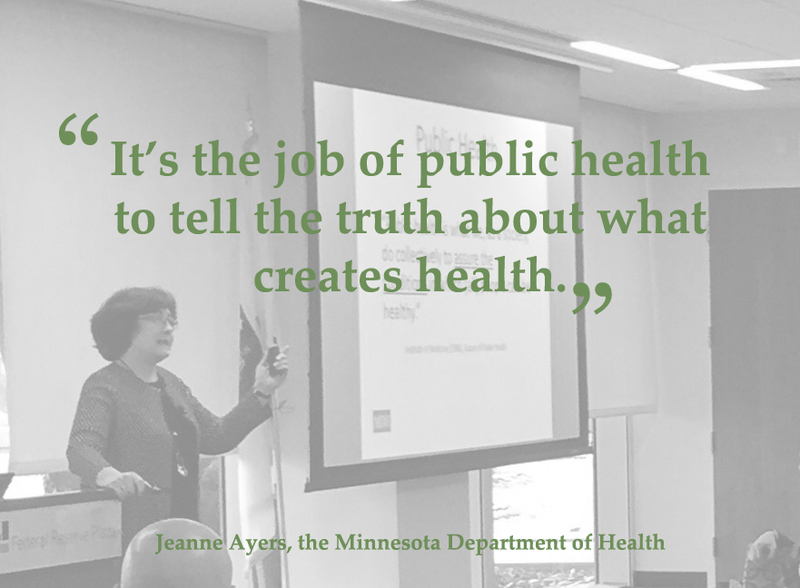 “It’s the job of public health to tell the truth about what creates health.” Conference keynote speaker, Jeanne Ayers, the Chief Health Equity Strategist for the Minnesota Department of Health inspired the room full of professionals. On December 8, 2016, over 100 people came together at the Federal Reserve Bank in Boston for an important dialogue about how to advance health equity in Massachusetts using Health Impact Assessment (HIA) and a Health in All Policies approach. The conference followed three regional HIA trainings held across the state in the month of November. Attendees from around Massachusetts represented a variety of sectors including transportation, housing, public health, health care, and land use/planning. The “truth” that Jeanne Ayers described is how disparities in health outcomes are largely the result of policy decisions that systematically disadvantage some populations over others, especially populations of color, American Indians, and the GLBTQ community. In other words: structural racism. Ms. Ayers shared enlightening examples of how, under her leadership, the MN Health Department has started to change their internal practices so as to upend the institutional policies and practices that risk perpetuating inequity in their state. The keynote presentation, in addition to comments from Massachusetts Department of Public Health Commissioner Monica Bharel, MD, Boston Public Health Commission Executive Director Monica Valdes Lupi, and a group of knowledgeable panelists, set the stage for a day rich with dialogue about opportunities to impact policy decisions and address inequities in Massachusetts. Among the topic areas discussed were transportation, criminal justice, affordable housing production and availability, and climate change. Participants also discussed establishing at statewide Health in All Policies Task Force, as well as effective strategies for community organizing. In January, HRiA will offer a follow-up webinar for those interested in learning more about HIA, health in all policies, and how these approaches can be used to address inequities. More information will be available on the HRiA website and an email invitation will be sent to conference and training participants in early January. A special thanks to the Tufts Health Plan Foundation for funding the HIA conference and trainings, as well as to the Massachusetts Department of Public Health (MDPH), and the Health Impact Project, a collaboration of the Robert Wood Johnson Foundation and the PEW Charitable Trusts, for additional support. HRiA was part of an amazing team that conceptualized and planned the conference including MDPH, the Boston Public Health Commission, the Metropolitan Area Planning Council, Partners for a Healthier Community, and Human Impact Partners.